Description: Shoot sunset, sunrise or nighttime photos for the first in the series of four Tamron 2010 Photo Contests. 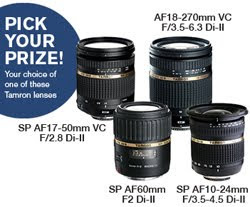 Prizes: The Grand Prize Winner will have his/her choice of a Tamron SP AF10-24 F/3.5-4.5 Di-II lens for Canon, Nikon, Pentax or Sony APS-C DSLR ($499 value), a Tamron SP AF17-50mm F/2.8 VC Di-II for Canon or Nikon APS-C DSLR ($649 value), a Tamron SP AF60mm F2 Di-II 1:1 Macro lens for Canon, Nikon or Sony APS-C DSLR ($569 value) or a Tamron AF18-270mm F/3.5-6.3 VC Di-II lens for Canon or Nikon APS-C DSLR ($629 value). Twenty finalists will be selected to be featured on Tamron's website. Eligibility: Contest is open to professional and amateur photographers 18 years or older residing in the United States using any brand lenses.